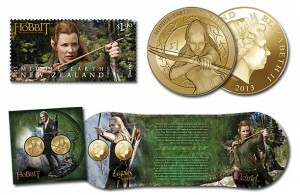 Lilly plays a fierce Elf warrior named Tauriel in the second film in The Hobbit Trilogy from Academy Award®-winning filmmaker Sir Peter Jackson, and is excited to feature on New Zealand Post’s latest collection of The Hobbit movie-inspired stamps and coins. “I’m on a stamp and coin from Middle-earth. It doesn’t get much cooler than that,” said Lilly. As a young teen, The Hobbit was Lilly’s favourite book. She fancied being a Wood-elf, but never dreamed in a million years that she would actually become one, and was thrilled when she had the opportunity to fly to New Zealand and try on her first set of Elf ears. “I have so much love for New Zealand and so I’m honoured that she is showing me such love,” concluded Lilly. As well as Tauriel, this year’s stamps and coins feature well known characters from the first film, The Hobbit: An Unexpected Journey: Hobbit Bilbo Baggins (Martin Freeman), Wizard Gandalf the Grey (Sir Ian McKellen) and Dwarf King-in-Waiting Thorin Oakenshield (Richard Armitage), as well as some exciting new additions, including Bard (Luke Evans) and the ever-popular Legolas Greenleaf (Orlando Bloom). New Zealand Post, in agreement with the filmmakers as well as Warner Bros. Consumer Products, along with New Line, MGM, Warner Bros. Pictures, has exclusive rights to produce official stamps and legal tender commemorative coins that celebrate Academy Award®-winning filmmaker, Sir Peter Jackson’s The Hobbit Trilogy. This year’s issue includes a premium gold coin and set, a silver coin with gold plating, a silver coin set, a brilliant uncirculated coin and set, as well as official stamp products. From Academy Award®-winning filmmaker Peter Jackson comes “The Hobbit: The Desolation of Smaug,” the second in a trilogy of films adapting the enduringly popular masterpiece The Hobbit, by J.R.R. Tolkien. The screenplay for “The Hobbit: The Desolation of Smaug” is by Fran Walsh & Philippa Boyens & Peter Jackson & Guillermo del Toro, based on the novel by J.R.R. Tolkien. Jackson also produced the film, together with Carolynne Cunningham, Zane Weiner and Fran Walsh. The executive producers are Alan Horn, Toby Emmerich, Ken Kamins and Carolyn Blackwood, with Philippa Boyens and Eileen Moran serving as co-producers. © Warner Bros. Entertainment Inc. All rights reserved. THE HOBBIT: AN UNEXPECTED JOURNEY, THE HOBBIT: THE DESOLATION OF SMAUG, THE HOBBIT: THERE AND BACK AGAIN and the names of the characters, items, events and places therein are trademarks of The Saul Zaentz Company d/b/a Middle-earth Enterprises under license to New Line Productions, Inc.